Guys: I'm in a new kitchen. I was sad to leave my previous kitchen, and was worried that the new one couldn't compare. But the way the sunlight comes in just so + my new butcher block countertop is really winning me over. While I brainstormed recipe ideas this week I wondered to myself: "What even is pink lemonade, really?" Turns out there's no universally accepted answer. Sometimes it's lemon + strawberry, sometimes it's lemon + raspberry, but for this recipe, it's actually lemon + cranberry! I'm itching for spring, and trust me when I saw these poptarts are like a sunny spring day in your mouth. We're going to make lemon curd, and you're going to love it. Yield: 16 (3x2 1/4") mini pop tarts. Whisk together flour, sugar, and salt in a large bowl. Using a pastry cutter or your fingertips, work the butter into the flour mixture until crumbly (the largest pieces should be the size of peas). Pour in two tablespoons of the heavy cream and 3 tablespoons ice water, then knead with your hands until it holds together. Don't overwork the crust! Divide it into two pieces, then flatten each piece into a disk and wrap in plastic wrap. Refrigerate for one hour. While dough is chilling, start your lemon curd! In a medium sauce pan, combine the lemon juice, lemon zest, cranberry juice, sugar, and eggs. Add butter pieces. Cook over medium-low heat, whisking often, until mixture starts to thicken (approximately 6 minutes). Watch carefully - don't let the mixture boil, or you'll end up with partially scrambled eggs! Scrape the mixture into a small bowl and refrigerate until needed. Preheat your oven to 350 degrees and line a baking sheet with parchment paper. Sprinkle your countertop or baking sheet with plenty of flour. 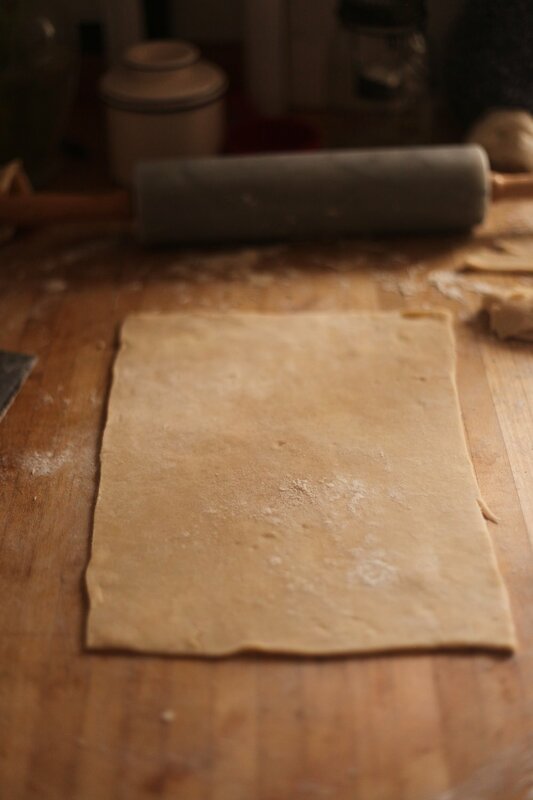 Remove half the dough from the fridge and roll it into a 10x13 rectangle, about 1/8" thick. Trim the edges so you have a perfect 9x12 rectangle. Place a mark every 3" on the long side of the dough, and every 2 1/4" on the short side of the dough. Using your ruler, cut across the dough evenly at each mark. You will end up with sixteen 3" x 2 1/4" rectangles. Repeat with the other half of the dough. Brush the edges of half (8) of your rectangles with heavy cream. Place a heaping teaspoon of lemon curd filling in the center of each of those rectangles. Spread the filling out a bit, but make sure it doesn't touch the edges of your pastry. 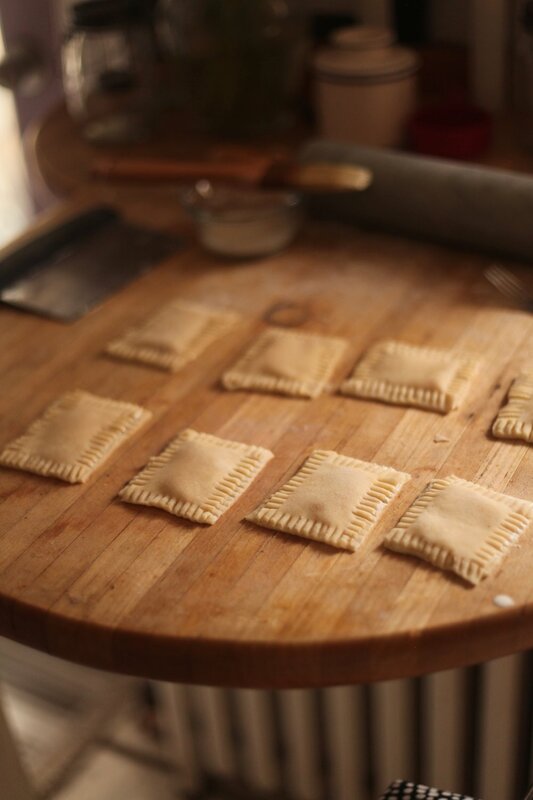 Place a second rectangle of dough on top of each poptart, using your fingertips to press around the filling. Use a fork to press around the edges of each rectangle. Prick the top of each tart with the fork a couples of times to vent. Brush the top of each poptart with the reserved heavy cream. Bake for 18-20 minutes, until golden brown. Let cool completely. In a small bowl, combine lemon juice, cranberry juice, lemon zest, and powdered sugar. Stir until smooth. Spoon frosting onto each cooled poptart. Top with sprinkles, if desired. Watch your lemon curd carefully - don't let it boil! It will continue to thicken in the fridge. If your pastry dough gets too soft while you're rolling/cutting, pop it in the freezer for a couple of minutes to firm up. You can do this without a ruler, but be warned that evenly sized poptarts are a stretch even with a ruler. Hint: mine weren't perfect either. Don't overwork your pastry dough - the less you work it, the flakier it will be!